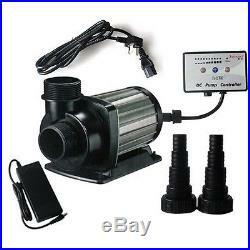 JEBAO JECOD DCT 4000 6000 8000 12000 DC AQUARIUM PUMP Submerge Pond Marine Fresh. Why are these better then the DT Models? DCT has a High performance motor with innovation electronics and energy saving up to 50% more then DCT. A New 10 Speed Controller. IC electronic detection, automatic power off protection upon no water sensor. Motor protection if rotor is blocked. Wear resistant ceramic shaft, longer operation life. Jebao are changing their name from Jebao to JECOD- which stands for Jebao ECO logical Design. All new products from Jebao will have this branding. This new enhanced range will replace the previous DC6000/9000/12000/15000 Features High performance motor with innovation electronics, and energy saving up to 50% than previous models.. Memory Function for Power Supply Off to recall memory 10 Speed Mode controller for T Series IC Electronic Detection, automatic power-off protection upon no water Motor Protection if rotor is blocked Super Quiet Operation Can operate in Marine and Fresh Water No Copper components , safety on your tank! With Wear-resistant Ceramic Shaft, longer operation life 10 Mins Feed Model(Or Pause to resume to normal) Internal Use Only! 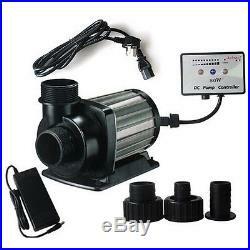 DC Pump do not suppose for External Use. Power Usage: 100V to 240 , 50/60Hz , 30W Flow Rate: Up to 4000LPH Voltage: 12/24V Watts: 30W Approx. Size: 14cm x 9cm x 11cm Max head: 3 Meter. Power Usage: 100V to 240 , 50/60Hz , 42W Flow Rate: Up to 6000LPH Voltage: 12/24V Watts: 42W Approx. Size: 16.1CM x 9CM x 11.5CM Max head: 3.6 Meter. Power Usage: 100V to 240 , 50/60Hz , 65W Flow Rate: Up to 8000LPH Voltage: 12/24V Watts: 65W Approx. Size: 18CM x 9CM x 14.5CM Max head: 4.5 Meter. Power Usage: 100V to 240 , 50/60Hz , 85W Flow Rate: Up to 12000LPH Voltage: 12/24V Watts: 85W Approx. Size: 20CM x 10CM x 14.5CM Max head: 4.8 Meter. Package includes: 1 X Jebao original in box 1 X Jebao Controller 1 X Jebao Power supplier 1 X Adapter, Which adapter do you use (UK / USA / EU/AU), Please leave message to us, thanks! However, you bought the item from opposite side of the earth, so it needs a little longer time to deliver. For example, Laser Pointer is unacceptable in some countries. Please leave note for your special request e. This 30-Days Guarantee gives you plenty of time to check items for color, high-quality, and size. We Strive For 5 Star. Excellent Service Is Our Goal, We strive to offer 5 Star performance in all areas of our business and want to make sure you are happy with the products and service you have received. We value every customer and will work to ensure your ultimate satisfaction. 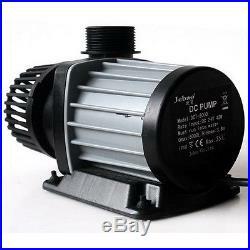 The item "JECOD JEBAO DCT 4000 6000 8000 12000 DC AQUARIUM PUMP Submerge Pond Marine Fresh" is in sale since Friday, January 6, 2017. 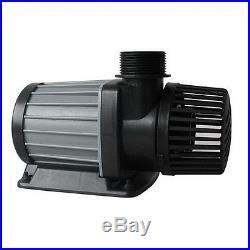 This item is in the category "Pet Supplies\Fish & Aquariums\Pumps (Water)".center" and is located in Shenzhen.